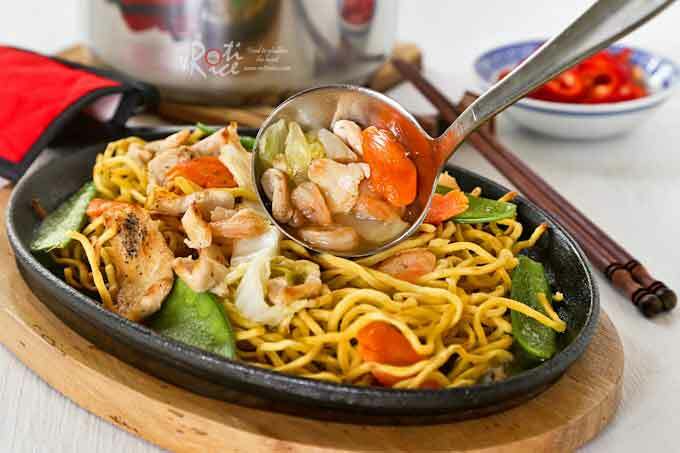 Hot and delicious Sizzling Pan Fried Noodles with chicken, shrimps, carrots, Napa cabbage, and snow peas. Especially satisfying on a cold day. I have always enjoyed foods served on hot plates. They look so exciting and appetizing sizzling away on those cast iron serving platters. 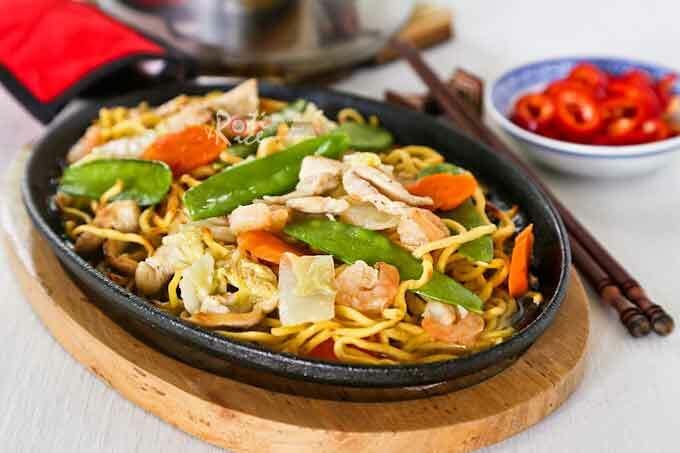 Anything from meats, seafood, vegetables, tofu, and noodles can be served on a hot plate. Today’s Sizzling Pan Fried Noodles, also known as Teet Parn Yee Meen in Malaysia is something I have not eaten in a while. I am so glad I finally found some hot plates at a store two weeks ago. Yee Meen is a kind of dried wheat noodles. It usually comes in a package of single-serve dried round cakes. They can be cooked in soup or drenched in sauce to soften and absorb all those wonderful flavors. Although I have not seen yee meen here, fortunately I was able to find substitutes and am quite happy with the results. This fresh pancit noodles I found at the Asian market have just the right texture for yee meen. 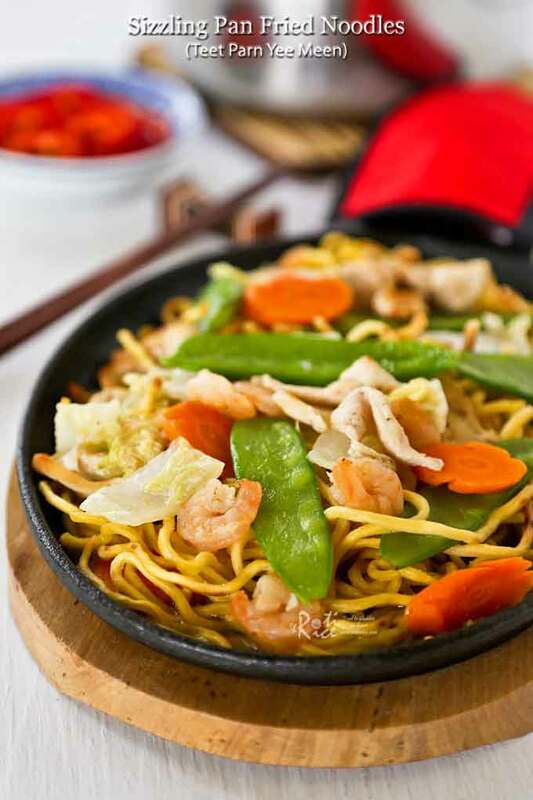 In the old days, yee meen was made by deep or pan frying fresh noodles to crisp them up. I pan fried the noodles with just 2 tablespoons of oil in a large non-stick pan to the desired consistency. I did not want to make them too crisp so that they will soften easily in the sauce. It worked out nicely. There are many ways to prepare the sauce for this tasty dish. 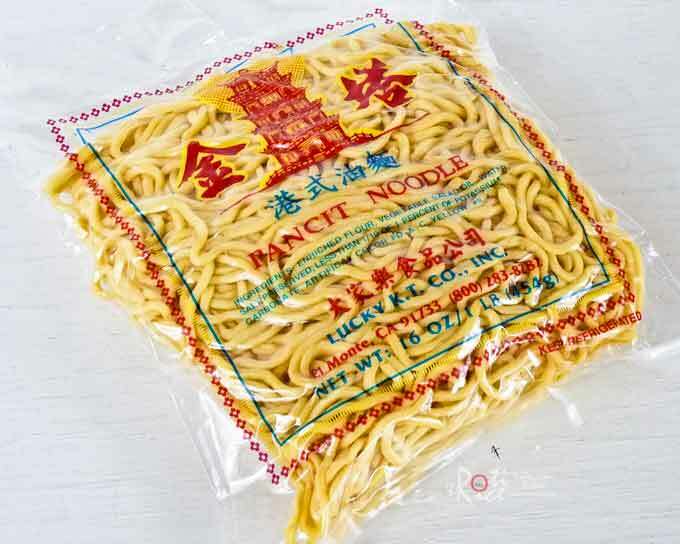 I used a similar one minus the eggs found in my Cantonese Style Fried Noodles. I also used slightly different vegetables that can withstand the heat better as they will continue cooking on those hot plates. Combine shrimps, chicken, soy sauce, and pepper in a bowl. Mix well. In a large non-stick pan, heat 2 tablespoons vegetable oil. Sear noodles for 7 to 8 minutes or until brown and slightly crunchy. Remove and set aside. Preheat 4 hot plates in the oven according to manufacturer’s instructions. In a large saucepan, heat remaining 2 tablespoons vegetable oil. Saute garlic for 1 minute. Add marinated shrimps and chicken and fry for 2 minutes. Add carrots and continue to fry for another minute. Pour in chicken broth or water and bring it to a boil. Season with salt. Reduce heat and allow it to simmer for 2 minutes. Add Napa cabbage and snow peas. Pour in corn starch mixture and allow it to thicken. Turn off heat. Remove hot plates from oven. Place them on their wooden trivets. Divide noodles evenly between them..
Pour sauce liberally over the noodles. The sauce will sizzle when it touches the hot plates. Serve immediately. 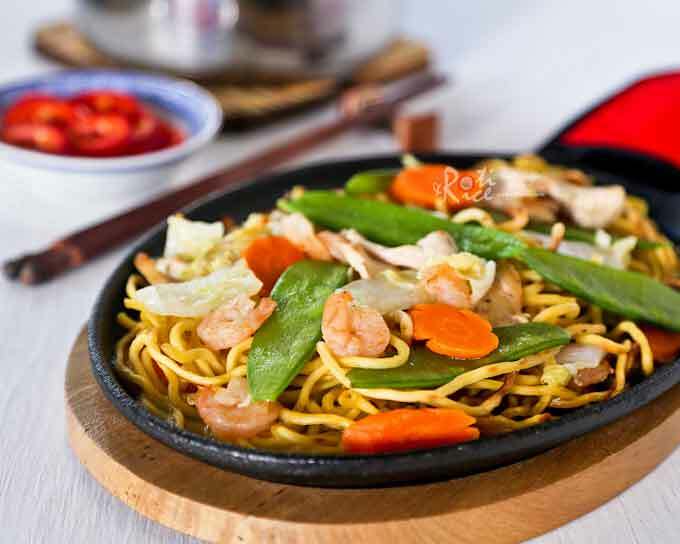 We thoroughly enjoyed this Sizzling Pan Fried Noodles. It would be especially wonderful on a cold winter’s day. Looks homey and scrumptious, Biren. Looks fantastic, Biren. Good instructions and recipe. Well done!